This anthology features two pieces of my poetry. One is Still With Me written for my late wife and the other, Let It Go for my son. Purchase a digital or hard copy here. Personal Essay in anthology: Beer and Butter Tarts Vol #1 Canadian Food Journal Published by Stained Pages Press. Pink Play Magazine – Quarterly LGBTQ+ Publication, feature articles. 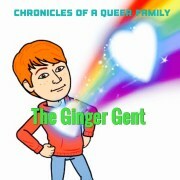 The Ginger Gentleman – Queer Parenting Blog for Pink Play Magazine.